Harvard University has launched a $6.5 billion fundraising campaign, the largest ever fundraising effort in the history of higher education. According to Harvard University, if successful the campaigned would result in an altered institution, with a thriving Allston campus, modernized student housing, a huge expansion at the School of Engineering and Applied Sciences, an enhanced global presence, greater financial aid, and a better resourced arts and sciences faculty. Harvard says it has already raised $2.8 billion in pledges and donations. So, it needs another $3.7 billion to hit its $6.5bn target. A question-and-answer session with Microsoft founder, Bill Gates, who left Harvard before completing his course to found the company. A speech by Drew Faust, Harvard President, at Sanders Theatre. A faculty panel on the new frontiers of knowledge at the Memorial Church. “We launch The Harvard Campaign at a moment when higher education is being challenged to reinvent itself, and we embrace this opportunity for a campaign that aims to do more than merely extend or reinforce long-standing strength and eminence. Harvard University’s last campaign raised $2.6 billion, it was concluded in 1999. Since then, it has had to face the same financial challenges all higher education institutions have had to endure during the Great Recession. In 2012, Harvard’s endowment stood at $30.7 billion. Faust emphasized recently against viewing such funds as a “checking account” that can be freely drawn down. The endowment is tied into a wide range of funds, literally thousands of them. Most of the funds are targeted at specific purposes, such as individual institutes, programs or named chairs. These funds need to be managed virtually forever. It means that only about 5% of the endowment money can be withdrawn in any given year. According to Faust, the current capital campaign has been launched amid “seismic shifts” in the higher education landscape worldwide. Higher education in the USA, UK, Europe and many other parts of the world is facing financial uncertainty. The Great Recession led to governments having to re-prioritize spending, and public-funded university research suffered. Universities are under growing pressure to spend more, as challenges to the global higher education landscape emerge. The explosion of online education prompted Harvard University to join with MIT (Massachusetts Institute of Technology) to launch edX, which provides online versions of classes at both universities – some classes are offered free-of-charge to students around the world. The physical spaces where all those things play out. Harvard University officials have specifically mentioned the School of Engineering and Applied Sciences, Allston campus, edX (online learning), arts and the humanities, and basic research into the environment, neuroscience, stem cells and energy, as areas of top priority for funding. Online learning, or e-learning, refers to studying via the Internet. Microsoft founder, Bill Gates was interviewed, before Faust spoke, by David Rubenstein, founder of the Carlyle Group. David Rubenstein interviewing Bill Gates. Gates admitted that the once-ubiquitous three-key combination to restart a computer – control-alt-delete – was a mistake. Gates added that now, with the benefit of hindsight, he perhaps should have stayed on and completed his degree at Harvard. Opportunities in the software industry would still have been there if he had graduated. Gates talked about his early days as an applied-math concentrator, his early years at Microsoft when free weekends and vacations eluded him, and his life after Microsoft as head of the Bill & Melinda Gates Foundation. 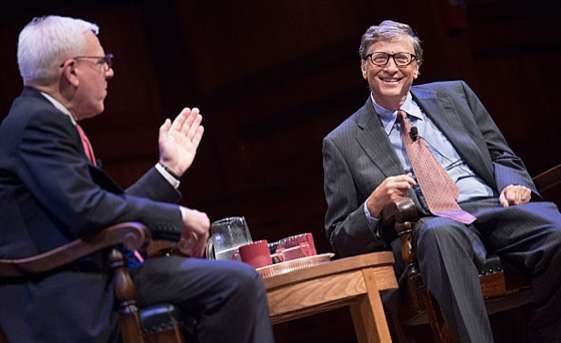 Gates also mentioned his early business experiences with Apple, his friendship with Warren Buffett, CEO of Berkshire Hathaway, and his love of bridge, which he still shares with Buffett. Gates also mentioned that Buffett donated billions to the Gates Foundation. The Gates Foundation aims to eradicate polio by 2018, and significantly reduce the incidences of malaria and measles worldwide. Gates said “Many of the problems we work on, it’s amazing how little has been put into it.”.